Epic Games shows off the cross-platform Unreal Engine 4 with... a Flappy Bird clone? The tsunami of Flappy Bird is still throwing off waves here and there as developers try to capture that magic before Flappy Bird is re-released for mobile (although, it seems as though Flappy Bird will be significantly different.) Interestingly enough, Epic Games has released a Flappy Bird clone, but not to jump on the bandwagon. Instead, Tappy Chicken is being used to show off the powerful Unreal Engine 4's cross platform development tools. The game is really more of a parody than a clone, with similar gameplay, but that isn't really the point of the game. The point of the game comes from this fact: it was built by one man who has no programming experience at all. Tappy Chicken is intended to show the flexibility and ease of the development tools provided by Unreal Engine 4. 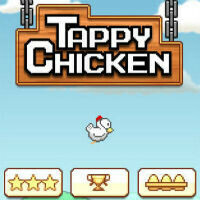 Tappy Chicken was built by Shane Caudle, and is available now for Android, iOS, and as an HTML5 web app. The game will continue to be supported and updated though, if you happen to like it. Unreal had to make a move, because Unity had made a similar push with its game development engine in order to make it easier for people to create games for multiple platforms, regardless of the graphical quality. Unreal has not only made the system far easier to use, but it has also dropped the cost to just $19 per month. This article made me laugh lol. Why does it add a little menu key to the right of the recent apps button when the game is opened? I m gonna make one myself. After school 2morrow. What? I want this on my Nokia... Oh. My bad.